(plural colo·nels) noun 1. military rank in United States: an officer in the U.S. Army, Marine Corps, or Air Force of a rank above lieutenant colonel 2. military rank in Canada: an officer in the Canadian Army or Air Force of a rank above lieutenant colonel 3. military rank in U.K.: an officer in the British Army or Royal Marines of a rank above lieutenant colonel 4. honorary title: an honorary title in a state militia, bestowed by the governor in some states. This practice is most closely associated with Kentucky, but also occurs in the states of Louisiana and Tennessee. [Mid-16th century. 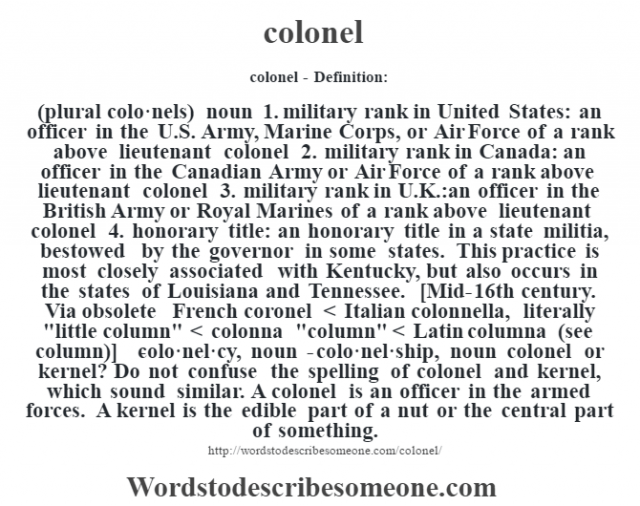 Via obsolete French coronel < Italian colonnella, literally "little column" < colonna "column" < Latin columna (see column)] -colo·nel·cy, noun -colo·nel·ship, noun colonel or kernel? Do not confuse the spelling of colonel and kernel, which sound similar. 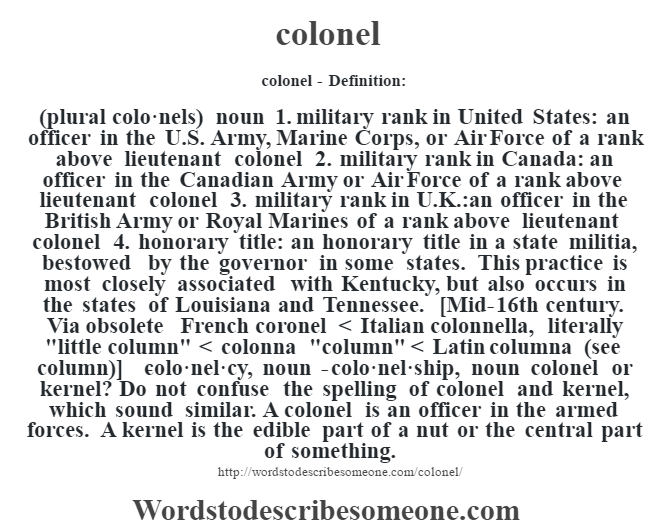 A colonel is an officer in the armed forces. A kernel is the edible part of a nut or the central part of something.